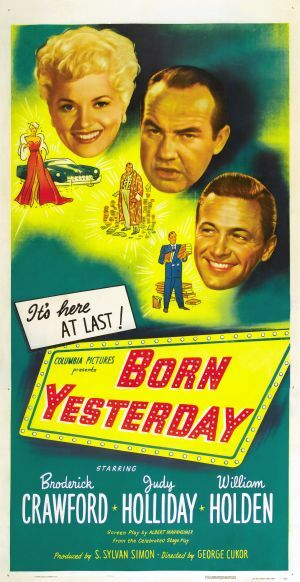 Enjoy “Born Yesterday” with the Cerrito Classics! Judy Holliday, perhaps the cinema’s greatest “ditzy blonde,” stars in June’s Cerrito Classic presentation, “Born Yesterday.” The 1950 film by George Cukor, one of Hollywood’s top Golden Age directors (“Dinner at Eight,” “A Star is Born”), stars Broderick Crawford as a rough-hewn businessman who hires the nerdy (in this role, at least) William Holden to teach his blonde bombshell girlfriend how to behave in society. How do you imagine she behaves with her attractive tutor? The folks at Rialto Cinemas have selected the classics with help from members of Friends. We cordially invite everyone to join us for a delightful evening! Settle back with a meal, beer or wine or a soft drink and enjoy! Thursday, June 10, 7:15 p.m. All seats, $7. Dion Boucicault’s 1841 classic, “London Assurance,” a production that has won raves from critics in Great Britain. Simon Russell Beale and Fiona Shaw star in this delightful comedy about love, country life, and fox hunting. “The whole show is a joy from start to finish,” the Daily Telegraph wrote. This National Theater production is shown via video feed. Adults $22, seniors (60+) $20, children (12 and under) $15. Monday, July 19 and Wednesday, July 21 at 7 p.m. Get tickets in advance at the theater or its website: www.rialtocinemas.com.